Ever heard the quote, “Snowflakes are kisses from heaven”? After shoveling 10.5 inches of snow from my driveway this weekend, I wasn’t sure I agreed. But after watching my dogs Maya and Pierson play in it, I’ve rediscovered the beauty of snow. 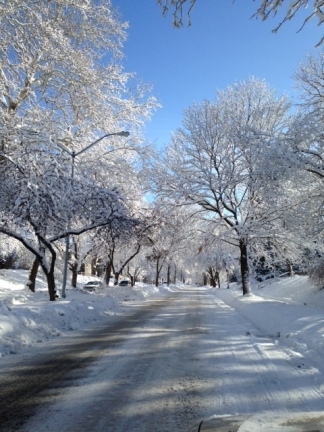 The street to my house after our weekend snow was so pretty that I had to pull over and take a photo. 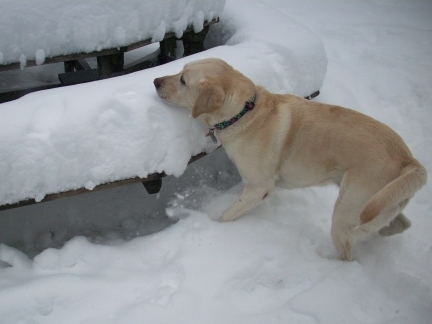 This bench in our back yard shows how deep the snow is compared to my Maya. 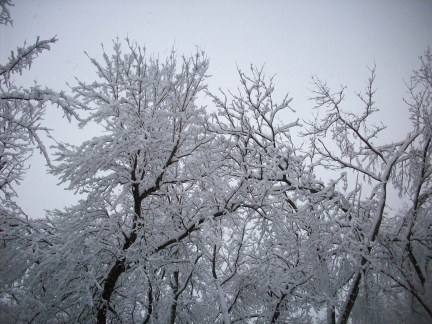 The trees in our back yard are heavy with snow. Some branches broke. 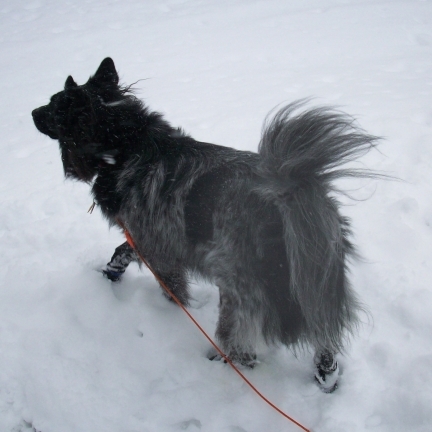 My fluffy boy Pierson likes the snow. Can you see his boots? 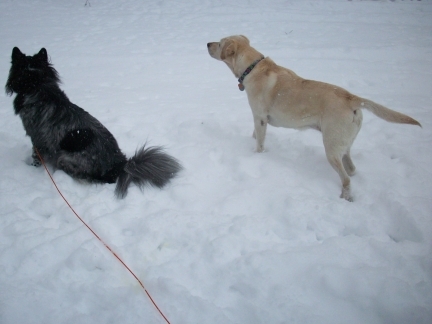 Maya and Pierson are looking at a squirrel that is sitting on a lower branch of a snow-filled tree. 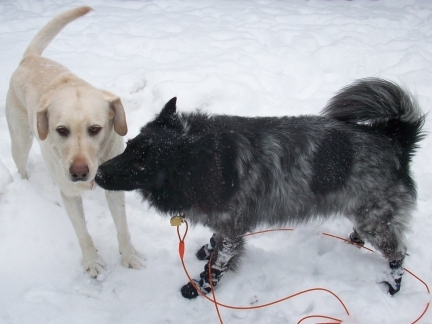 Pierson gives Maya snow kisses. Okay, so it’s not so wordless. I just can’t help but to comment on the photos. You’re welcome to leave a comment too. 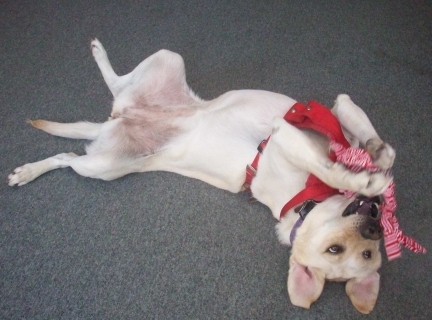 Thanks for stopping by and Happy Wordless Wednesday! Maya had an absolute blast on Tuesday, September 3, 2013. 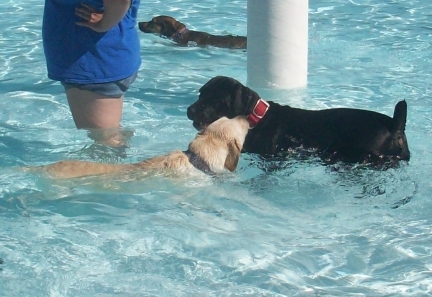 Tuesday was the annual Pooch Plunge held at the Outdoor Aquatic Center in Lawrence, Kansas. Check out these great photos and the video I put together. PAWSOME! 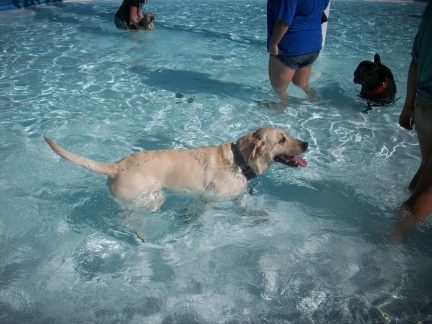 My Labrador Maya gets to swim in a public pool for the annual Pooch Plunge event in Lawrence, Kansas. Just look at how happy my Maya is. Maya gets to meet a lot of other dogs having fun swimming in the pool. There were no balls to play with so Maya stole this pool toy. Maya loves sticks. 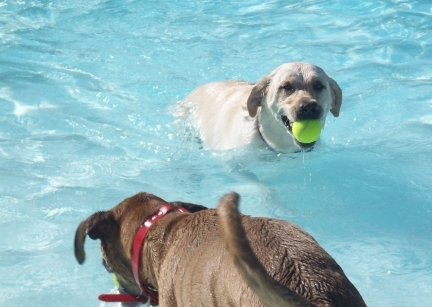 But since there were no sticks or balls in the pool, Maya takes a pool toy instead. Maya, what are you going to do with that toy? Maya eventually got out of the pool and proceeded to run around the pool complex with the pool toy in her mouth. It was like she was showing off her ‘capture’. 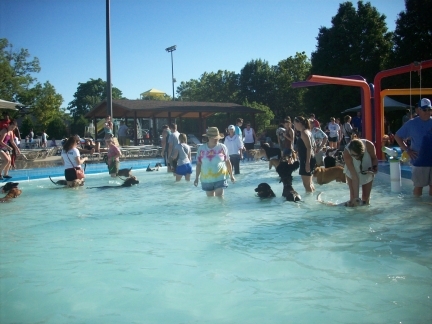 Lots of people and doggies swimming and having a good time in the public pool. It got even more crowded than this later on. Other dogs had a good time too. Look at that pug go! 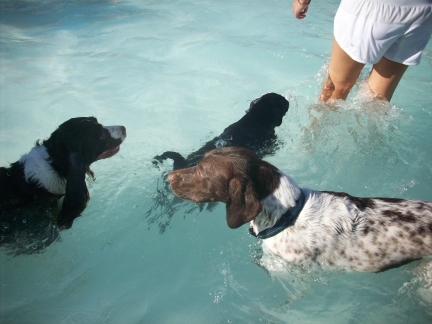 And there is an Aussie and a German Short-haired Pointer. 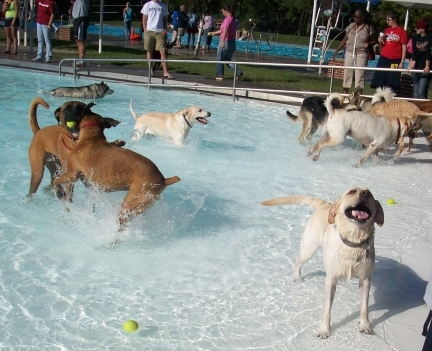 Every year in the Kansas City metro area several public pools open up to the dogs. They do it at the end of the season just before they drain them. 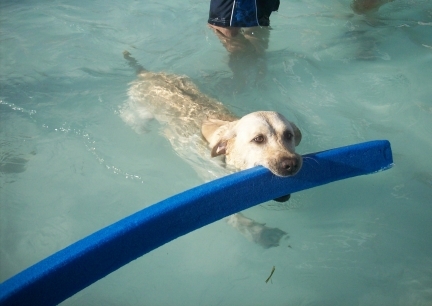 Here is Maya having a good time at Young’s Pool in Overland Park, Kansas for the annual Pooch Plunge. 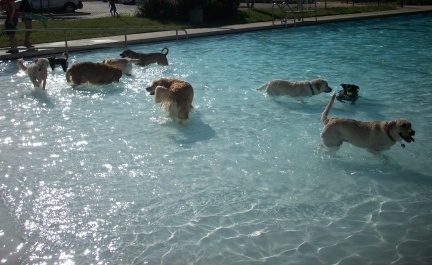 So many yellow Labs swimming at the public pool that I can barely tell which one is Maya. No worries, though. Maya didn’t completely miss out. 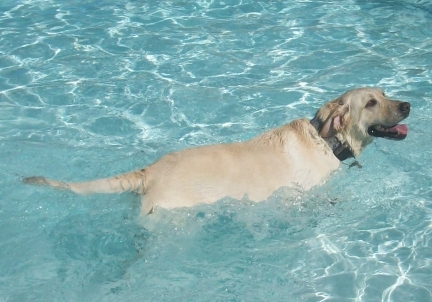 There is another Pooch Plunge event here in Lawrence at the beginning of September. We’re going, even if we have to walk there! 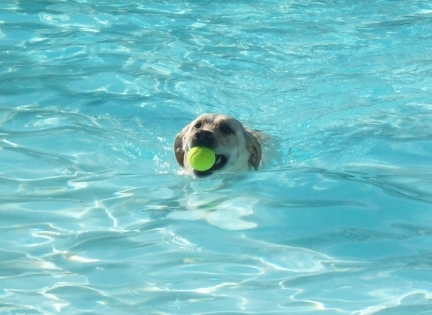 Lots of tennis balls were provided for the pups at the pool to fetch. Here comes Maya with one! 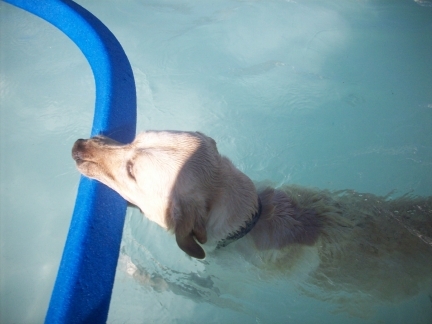 Even though the above photos aren’t current, I’m showing them to you now so perhaps you can check your area to see if any of your public pools open up for the dogs. Now’s the time! And if you don’t have any, maybe you can inspire your local parks and rec to do it next year. 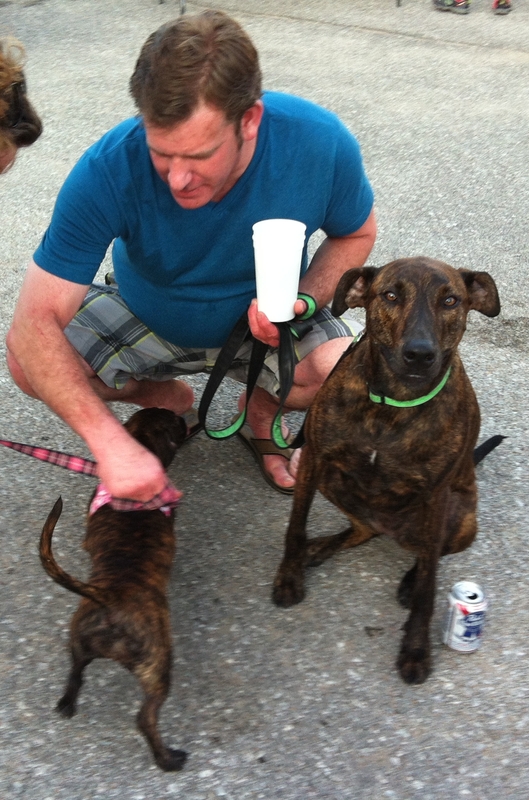 I decided to take Maya to another pet event benefiting the Lawrence Humane Society. Maya is over her doggy cold and the vet confirmed she is clear to go! 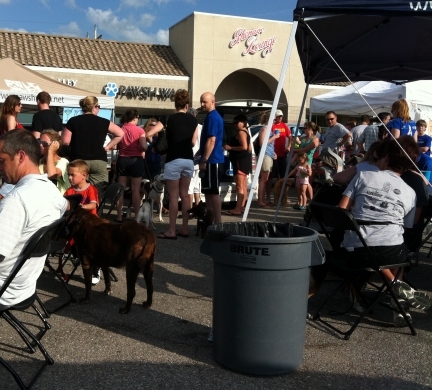 This event was the Mutt n Strut and it was held in front of our favorite place to go get a dog bath – Pawsh Wash. We didn’t participate in the walking part of the event, but we enjoyed socializing. 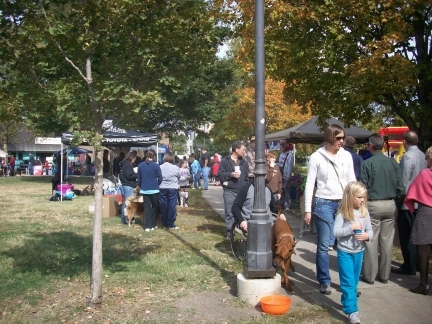 The event had a few pet supply vendors and some delicious food for both dogs and people. And we were able to sit down and enjoy the band. 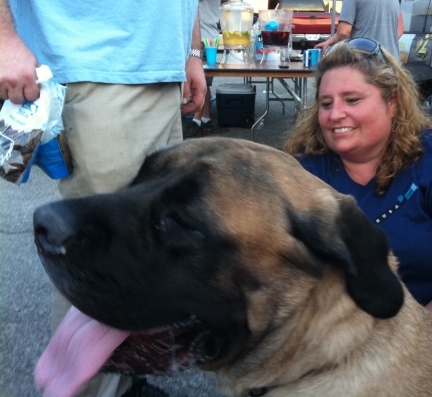 This is one big dog! I think his name was JuJu. 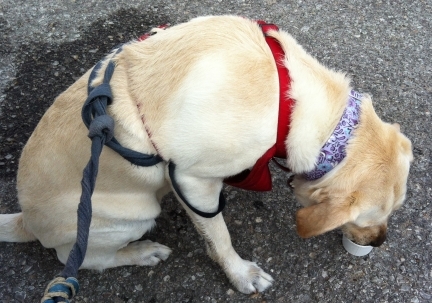 Lots of people and dogs at the Mutt n Strut held in front of the Pawsh Wash.
Maya eating ice cream made just for dogs. “I swear we’re not related.” These two dogs just met. It seems they have a lot in common. Maya also got to play in the kiddy pool. She is a little wet in the photo above where she is eating a doggy ice cream cup. She is also showing off her new dog collar that we bought from one of the vendors, Daisy Diva Designs. Sarah is the owner of that business and I’ve bought these handmade dog collars from her before. I love how they are custom made. I almost always get a lavender design and a 1.5″ width. There were also dogs there showing off their disc catching skills. We saw our friend Oscar doing some neat tricks. And we saw lots of dogs up for adoption. It was a hot day, but cool misting fans were set up for both people and pets. And there were several kiddy pools. There were also some shaded areas under tents or trees. The event lasted from 5:30 to 9:00pm, so while it was hot at first, it did cool down. Maya and I had a great time! I wish I had taken more pictures, but I was having too much fun. 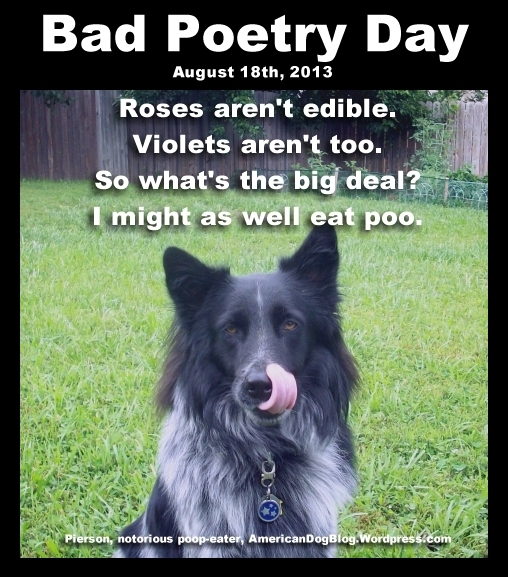 PEJUYN39SY8V Today, the American Dog Blog goes British. What is Crufts? Crufts is a huge dog show in the UK. 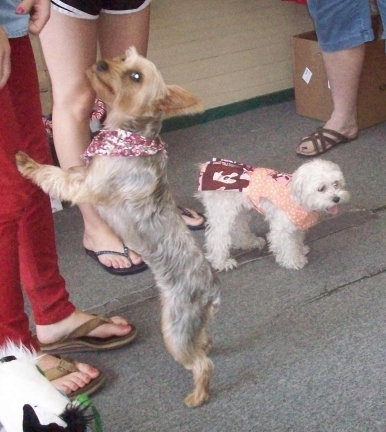 It is not only a dog show of dog breeds, but also for other types of dog competitions. One competition is for dog agility. 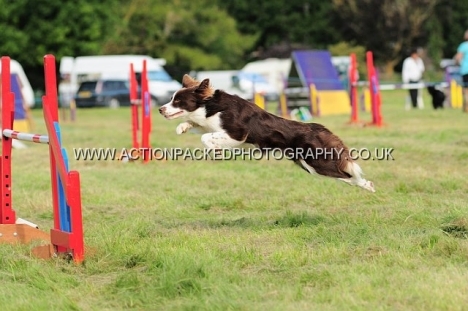 And one section of the dog agility is from the Young Kennel Club, which is for dog owners 18 years old and younger. That would be Sassy’s mom, Naarah. I have been visiting Crufts for a good couple of years, but I never really thought about me competing there with my own dog! 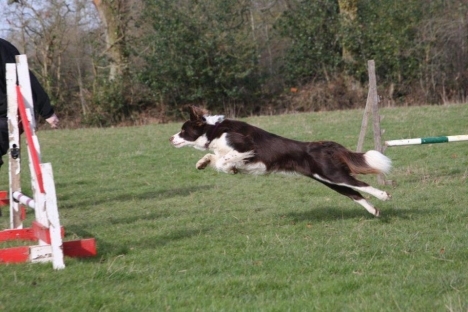 Ever since agility foundation training, Sas took to agility like a duck to water. I have been so shocked and happy with Sassy. 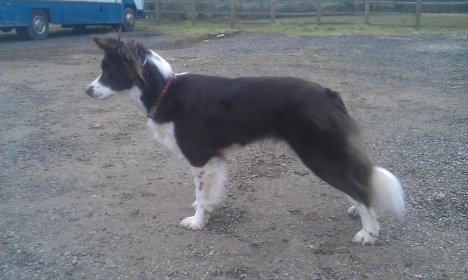 She has done so well as when she qualified me for Crufts she wasn’t even 2 years of age! She’s such an honest little dog who throws herself at everything. In fact when I was walking the qualifier I noticed that the tier was the first obstacle on a relatively large lead out (I may just add she had never done the tier before as it completely slipped my mind to train it) so as I lead out I thought she would run around it after release. But no she jumped it like she had done it a million times before! I couldn’t really ask anything else from her that day. She won the qualifier by 6 seconds and it felt like an amazing run. Every day she makes me smile and makes me so proud to call her mine. 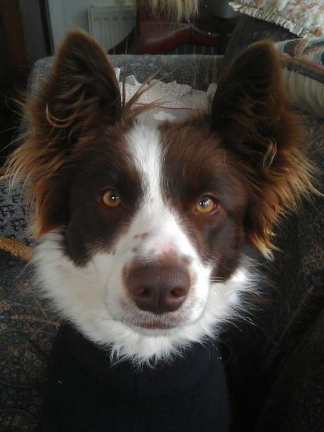 I would also like to add how happy I am that Joanne, her husband and their fantastic company (www.fleecedogharnesses.co.uk) are supplying Sassy’s Crufts harness and my very special Crufts fleece! We will have more pictures of Sassy later. Joanne, a friend of mine, brought Sassy to my attention and I think Sassy’s great! She makes me want to do agility training with my dog Pierson. Crufts is a huge deal and I am so glad to know someone who has qualified to compete in it. 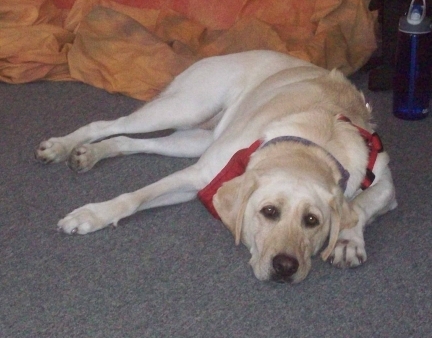 Our other blog, Pet Auto Safety Blog, is having a pet travel photo contest. Details on how to enter to win a $25 gift card are HERE. Basically, send us a photo of your pet on vacation. It doesn’t have to be a long vacation. It could be as simple as a day trip such as in the first two photos below. In these first two photos, my dog Sephi met her play-date, Sunny, at the Shawnee Mission dog park. Sunny was a Golden Retriever and this was his first trip to a dog park. Sephi showed him the ropes. The third photo is of Sephi and my sister’s dog Mocha. Every year for the holidays my family and I pack up the car, drive from Kansas to Texas, and spend time with family. Of course, family includes the dogs. (And the dogs ride safe with their dog seat belts.) 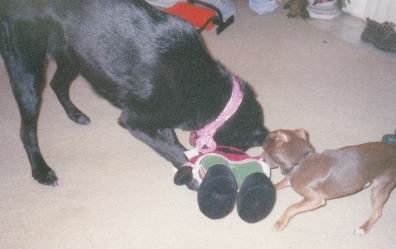 In this third photo, Sephi and Mocha are enjoying their holiday by playing together with this stuffed dog toy. The Shawnee Mission dog park has a lake for swimming. Sephi wants to show Sunny how it’s done but she doesn’t want to do more than get her feet wet. 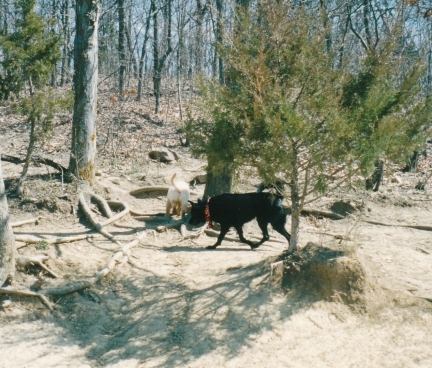 Sephi and Sunny explore the wooded area of the Shawnee Mission dog park. Sephi and Mocha tear up a dog toy together. Sephi obviously has the advantage. These are examples of the types of photos you can enter into our pet travel photo contest. 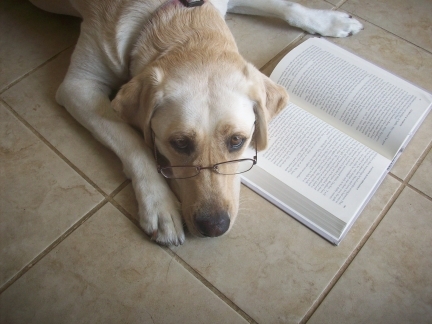 Remember to visit our Pet Auto Safety Blog for more information! 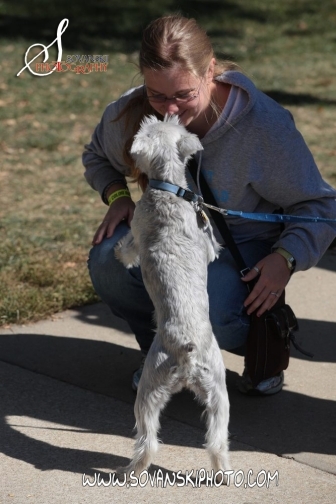 Sadly, I did not take many photos at Dogtoberfest this year. I was distracted. I was initially distracted by Maya and Pierson. I know Pierson doesn’t care for other dogs much but he did so well at The Dog House around other dogs that I decided to see how he would do at Dogtoberfest. It did not go well at all. He tried to go after every single dog that went by. This, in turn, made Maya go crazy too. So I had my husband take Pierson home. After that, Maya calmed down. The second thing I was distracted by was the cool weather. I was freezing! Thankfully, we still had a lot of visitors to Dogtoberfest despite the cold. Lots of visitors, and this is just near the entrance of the event. I met a lot of people and a lot of dogs. 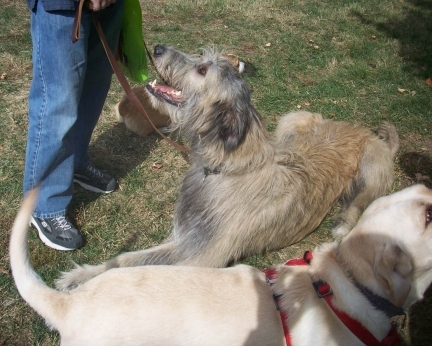 But dumb me didn’t think to take pictures of all the cute dogs until I saw the biggest dog I have ever seen… this Irish Wolfhound. He was twice as tall as my Maya! And so sweet. You can’t really tell how big the Irish Wolfhound is in this picture but standing, he stands twice as tall as my Maya in the foreground. 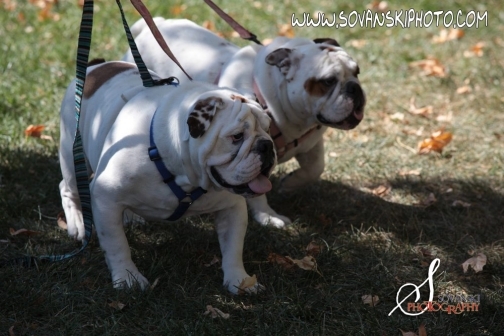 Since I didn’t get that many photos, I asked Jim Sovanski with Sovanski Photography, who also had a booth at Dogtoberfest, if he would lend me some of the photos he took. So here you go! 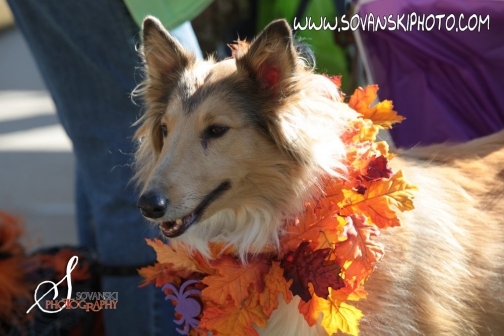 The beautiful Collie is all dressed up for Dogtoberfest. 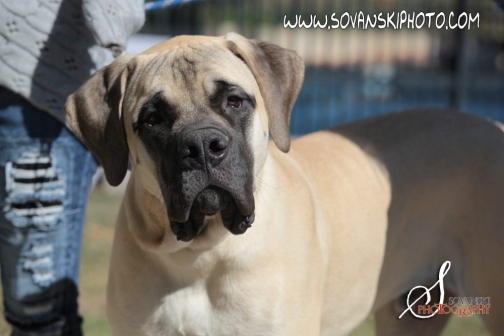 Look at Titan, the beautiful Mastiff. He had fun at Dogtoberfest too. 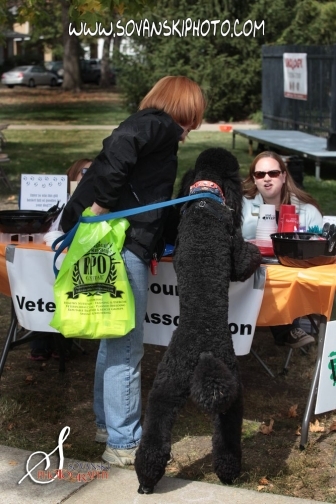 It wasn’t just people checking out all the pet vendors at Dogtoberfest, it was the dogs too. People didn’t just go to Dogtoberfest to shop for pet stuff, they went to watch dog agility, disc dogs, pet trick and costume contests, and to meet other dogs. Some dogs, but not this one, were there for adoption. If I’m not mistaken, these cute guys are named Stomp and McKenzie. Adorable, right? All-in-all, it was a great day. The day eventually warmed up and everyone was great. And Maya helped me with a short presentation on why keeping your pet safe in the car is so important. Do you have any fun pet events in your home town? 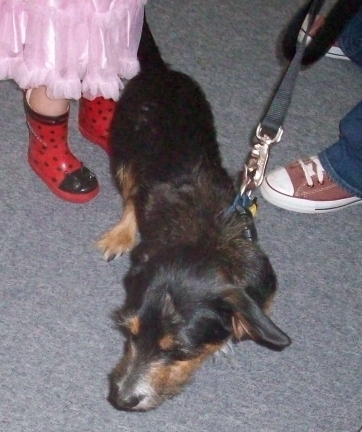 For more photos from Dogtoberfest, check out our Pet Auto Safety Blog and also join the Wordless Wednesday blog hop. 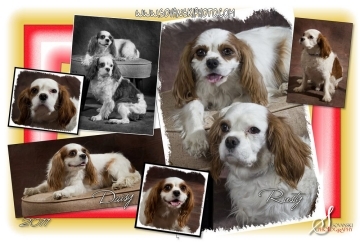 Get a collage of your pet from Sovanski Photography. 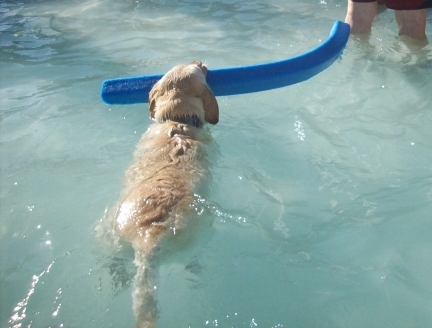 Have you gone somewhere fun with your dog? My dog Smokey and I went on a lot of vacations with me. 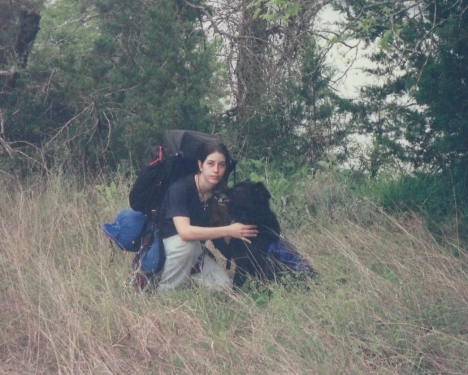 I was really into hiking back then (about 15-20 years ago) and so was Smokey. He had his own back pack and everything. Our two best trips were our 3-day hike around Georgetown Lake in Texas and our week-long trip to Arizona. If you’ve had a fun vacation with your dog go visit our other blog, Pet Auto Safety Blog, for more details on how you can win a $25 gift card. 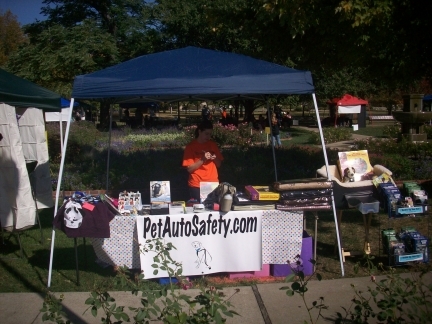 Pet Auto Safety will be at the Dogtoberfest here in Lawrence, Kansas tomorrow (October 7th). If you are in the Kansas City area, consider coming to Southpark, located on Massachusetts street in downtown Lawrence. The event is from 10am to 3pm. There will not only be vendors like myself, there will also be a lot of activities. Check out the disc dogs in action, have your dog try out an agility course, kids make crafts, adults answer dog trivia questions, everyone can win prizes. 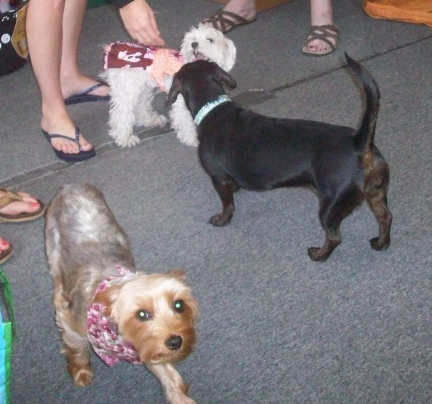 Maya at Dogtoberfest 2011 wearing her dress from Bow Wow Wow Gifts and playing with another dog. The beautiful park where Dogtoberfest was held. I’ve had some of my pet stuff being sold in a consignment shop called The Dog House here in Lawrence, Kansas. 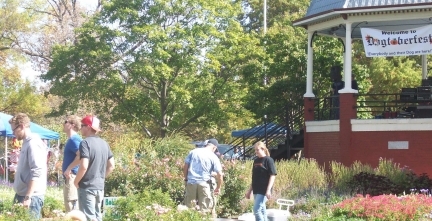 The Dog House started with the Lawrence Community Shelter and the Good Dog! biscuits. But the shelter has a new facility so it is time for The Dog House to come to an end. The Sale-ing Out of Summer event was the final hurrah. I took Maya who had a great time playing with other dogs, meeting people, and licking the faces of young children. 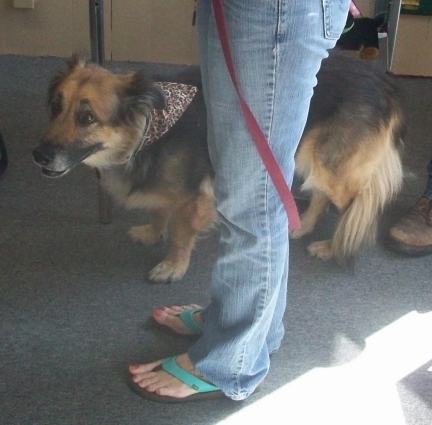 Here are some photos of Maya and some of the other people and dogs who came to say goodbye. Roxy, the Dachshund, is checking out a puppy dog who is getting to try on some handmade dog clothes made by Roxy’s mom and aunt with Bow Wow Wow Gifts. Those cute puppy dogs again! This is Earl. 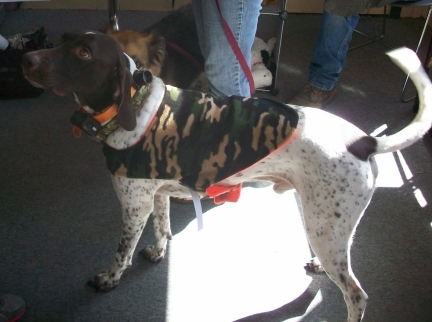 He is also wearing handmade dog clothes from Bow Wow Wow Gifts. I think this dog’s name is Sadie. Her mom brought her to the Dog House for a nail trim and to shop around for some cute pet stuff. I can’t remember this dog’s name but he/she is also here with mom to shop at the Dog House. Maya got to play with lots of dogs but she also got to play a little on her own. Here she is enjoying a handmade dog toy. 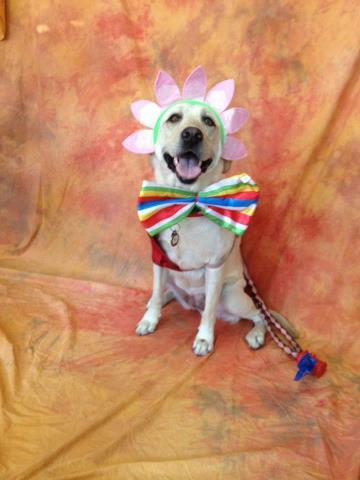 The Dog House event had a fun photo shoot where you could dress up your dog. Maya looks like the little clown that she is. The Sale-ing Out of Summer event at The Dog House was 4 hours long. Maya and I were there the entire time, and even some time before. So obviously Maya is quite pooped. It’s not quite the final goodbye, though. A couple of the ladies who were part of the have decided to open a new consignment shop called Wags & Whiskers. The old Dog House will be under construction for the next few months and hopefully The Dog House will be ready as Wags & Whiskers in early 2013. I can’t wait and neither can Maya! It’s not the grandest St. Patrick’s Day parade in the country – just a small affair for a small town. But since I live here and because there will be dogs in the parade, I am going to talk about it. I am part of a co-op group called The Dog House. I rent a space in The Dog House shop and sell pet-related items. 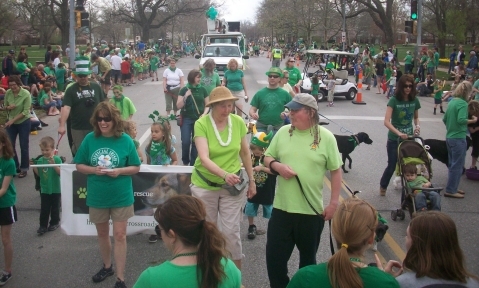 Many of the people who participate in The Dog House group will be in the parade. One, I’d like to share is Bow Wow Wow Gifts. The ladies who own this company make unique clothes for dogs. 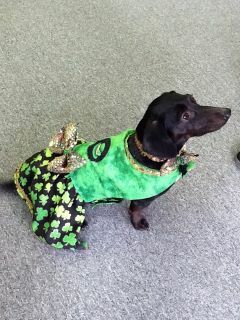 Their dogs and some of the dogs of their customers will be sporting St. Patrick’s Day apparel in the parade – so cute! The above photo is a preview of the St. Patrick’s Day pet apparel. If I am able, I will post photos of the parade later today. I am part of the parade, too, although I won’t have my dogs with me. Maya is too difficult to handle in such an exciting event and Pierson will be too afraid of all the loud noises. My part in the parade is to assist the person who wears The Dog House dog costume in the parade. Happy St. Patrick’s Day! Come back soon to see if there are any more photos. 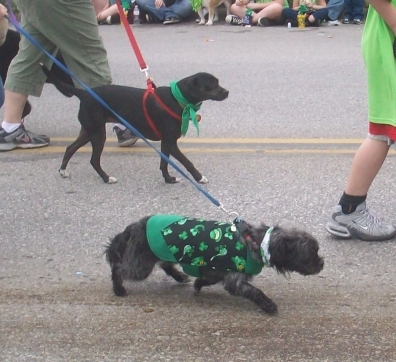 More dogs in cute St. Patrick’s Day clothes. There were more people at the parade than I thought there would be. This is a photo looking behind. This is a photo looking forward. For more photos, visit our PetAutoSafetyBlog.com.